It’s that time…time for setting some goals for the year. I don’t do resolutions…but I set goals for the year, then break them down into weekly goals to help me stay focused and moving in the direction of meeting these goals. Because my “word” for the year is simplify, and because this will be a transition year for us…I’m keeping my personal and parenting goals simple. I’m hoping to build them into our daily schedule, and focus on just what it is in front of me and where we are in our schedule. i.e. Not pondering the latest internet technology when I’m supposed to be helping Ryan with his auditory processing, or cueing Tyler through the 2 syllable “phrase” we are working on that week. Read 1-2 books per month. Some simplicity book, some Bible study books, some fun and light reading books. Weekly goal: Read 3-4 chapters/week. Run a half marathon. Weekly goal: Gym or outdoor run at least 3x/week. GPS journal. Keep a daily Gratitude, Prayer and Scripture journal. It’s a simple way to keep my mind and thoughts where they should be as we transition this year. Ryan – stay ahead of his SPD and impulsivity by encouraging “heavy work” activities from home. Daily therapeutic listening and work with 2 step directions and auditory processing skills. Charlie – continued work on articulation for certain sounds. MOVE TO TEXAS. Weekly goal: paint, tear out wallpaper, paint. Clean. Not rip my hair out trying to keep the house in good shape for potential buyers with 3 little boys running around. Maintain a clean house on a daily basis…so I’m not running around like a nut when we get showing calls. Daily goal: load of a laundry/put away, load of dishes, sweep and vacuum, dust. Weekly goal: Deep clean 2-3 rooms in the house. Continued service in the church, and with small group. Weekly Goal: prepare for study, meetings and service when called upon. Spend as much time as we can with our friends in Ohio. Make fun and lasting memories with our kids’ friends as well. This will be a spontaneous goal…as that’s how my friends and I tend to do best. Hey, let’s get together tonight! See now why my word is simplify is so significant. There will be no way for me to keep up with all the transition going on in our lives, with my blogging work and keep the house clean. I just don’t have time for complicated. If you are interested in putting your goals to work for you, I highly recommend getting them down on paper, reviewing them and working on them every week. After attending a Dave Ramsey Entreleadership seminar back in April, I developed this weekly goals sheet. It’s part goals, part to-do list. With sections on expected expenses for spending accountability, anticipated errands and Scripture memory/application. This simple tool (there’s that word again!) has worked best for me…because it’s not too complicated. I don’t have to cross off how many glasses of water I’ve had that day, or if I did the laundry, or did the dishes, or read to the kids. I already do those things…every day. They are part of our daily routine. I don’t have the time or energy to worry about drinking enough this, or if I need to do the laundry. Do a load of dishes a day and a load of laundry a day (or every other depending on your family size)…you’ll never fall behind. And you won’t need to put it on your to-do list. 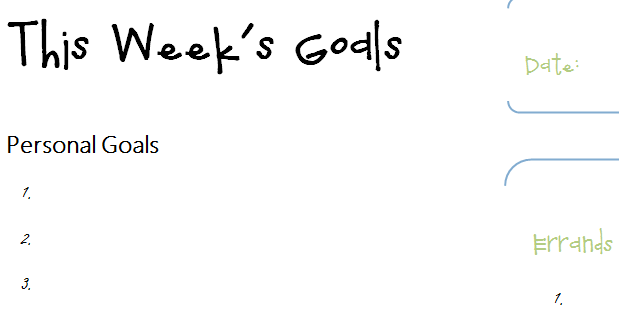 I print this weekly goals sheet out and fill it in before our Sunday Night Meeting every week. I use it to map our my week and I do my best to get each item finished by week’s end. And it has been SO helpful in keeping me on track and helping me meet my small, medium and large size goals! Happy Goal Setting and Achieving! Congrats on the goals, moving plans! A Texan again! And thanks for the planning sheets. You’re welcome! We’re excited to be moving back! Can you tell me a little about the therappeutic listening that you are doing? I have a child with SPD and have been intersted in this and if it really helps or not. I have learend a little about the how your engine runs program. Is that whay you are using? It was recommended to us when he was 2 1/2 and we’ve been doing it (off and on, but mostly on) since then. He does so much better in general, behavior, processing, etc. when he is on it. I believe you can only do the “modified CDs” when they are purchased through your OT. They aren’t for sale to the general public. I also used the “unmodified” music with Tyler when he was a baby, having trouble with drinking and swallowing. Not how effective they were because we were trying a lot of new things at once to help him out. Oh, I wish I were in San Antonio. My husband is from a little town south of there, and we visited in November. We spent an entire day in the La Cantera mall area. Loved it! Welcome back to Texas (hopefully sooner rather than later). Simplify is one of my goal words this yea too. Good luck with everything. We are so going to miss you dearly when you move. I know how much moving back home means to you and your family. Just know that your friends here will miss you dearly. But I have a large enough house that you will always have a place to stay when you come visit. Well, I will come back for visits…as we have family here too! And we can hoopla then! I read Organized Simplicity & Breathe….both good simplicity books. Great system with your goals Erin.. I like what you do sunday evening – Total accountability..! Wow, you have a lot happening this year! Simplify sounds even better know. Hang in there! Yes it does Gina! It’s the only way I’ll maintain my sanity through it all! I’ve got a lot of similar goals to you since we’ll be going through a move this year too (to Boulder, CO anytime between end of May and beginning of August). Love the free printable and taking daily steps to meet the goals. It’s so easy to make goals and do well in January, but forget about them by March or April. Having to be accountable for it daily will really help. Indeed it is! This is really the only way I’ve had success with keeping up with goals! Hope you find it helpful Katie…especially as you transition too! Thank you for sharing your goals. I was just sitting down and trying to figure out my goals. Erin, I can’t wait to see how you save money on groceries when you’re back in San Antonio. Our biggest grocery store, HEB, doesn’t offer the same double coupon deals like Kroger. Good luck on the house sale! good luck with the move! IS there a particular reason ur moving back?I heard Tx is HOT!! !